During rush hour, on the stretch of Terwilliger Boulevard between Lewis & Clark and SW Taylor’s Ferry Road, an endless parade of cars blocks the left turn onto SW Primrose St, a vital conduit to campus. Four years ago, a former student working in the registrar’s office was making the turn when he was hit, and his body thrown through a van’s windshield. Damian Miller, coordinator of instructional technology and program assessment and a bike advocate, learned of four or five such crashes. Over a month, he crafted a petition that could prevent further tragedies. By press time on Nov. 12, 47 people signed. A close look at the petition’s proposed bike and pedestrian improvements, and what it would take to make them a reality. 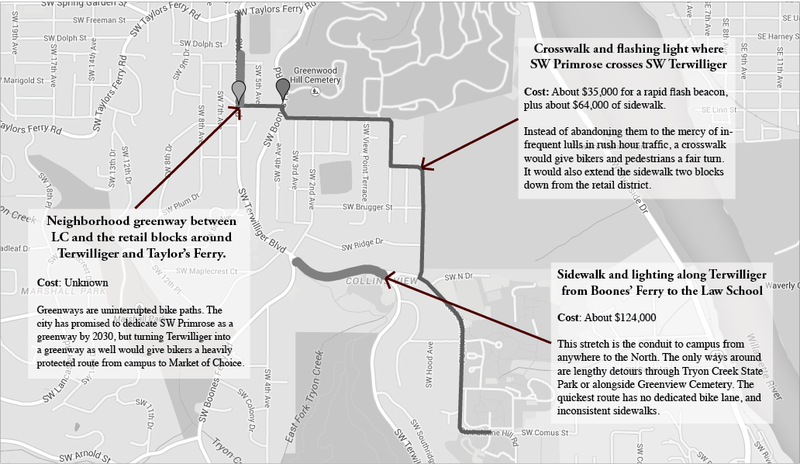 Costs are estimated using past news reports and Portland’s tax rate for homeowners charged with replacing sidewalks.